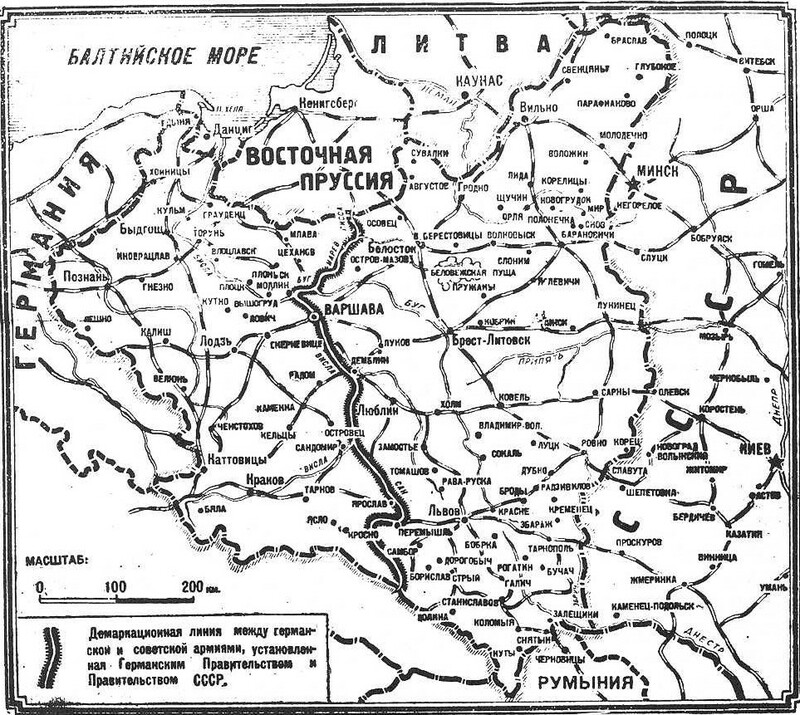 The "Secret Protocols" were not entirely "secret"
The map below was published in Izvestiia on September 23, 1939, the day after the Red Army crossed the border. It clearly shows the line of spheres of influence, here called "Line of demarcation between the German and Soviet armies established by the German government and the government of the USSR." The map below was published in The New York Times on September 23, 1939, five days after the map above. It too shows the line of spheres of influence, here called "the demarcation line between the Russian and German Armies." This title shows that it was based upon the map in Izvestiia above. The Secret Protocols of the Molotov-Ribbentrop Pact are often discussed as though there were something unusual and shameful about the practice of secret military agreements. This is dishonest and misleading. In fact both Britain and France had secret military treaties with Poland. 1. The "Secret military convention" of the French-Polish treaty (trait� franco-polonais) of February 21, 1921. 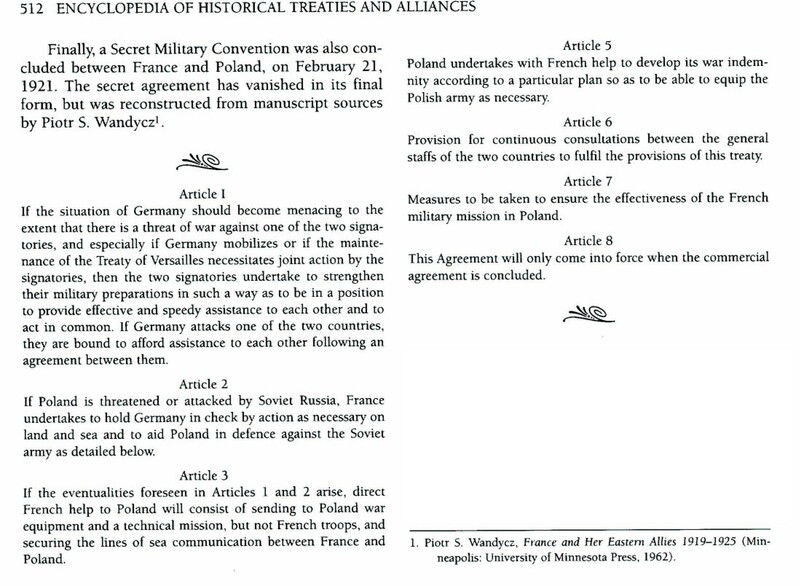 According to Charles L. Phillips and Alan Axelrod, Encyclopedia of historical treaties and alliances (New York : Facts on File, c2001), the text of this "secret military convention" has "vanished" (vol. 2, p. 512). The treaty, and its "reconstructed" secret military protocol, are also published in J(ohn) A(shley) S(oames) Grenville. The Major International Treaties 1914-1973. (London: Methuen & Co., 1974), pp. 116-117. 2. The "Secret Protocol" of the August 1939 British Treaty with Poland. This was a secret clause specifying that the alliance applied only against Germany. Pretty important clause! The copy of the secret clause below is taken from Charles L. Phillips and Alan Axelrod, Encyclopedia of historical treaties and alliances (New York : Facts on File, c2001), p. 536. But no primary source is cited for this text, and the name of the Polish signatory is given as "RACZYMSLI" -- it should be "RACZYNSKI". Is this a scanning error? a copy error? Whatever the case, the fact remains that this British "secret protocol" remains far more secret than the supposedly nefarious "Secret Protocol" of the Molotov-Ribbentrop Pact ever was. Anthony Carty, Richard A. Smith. Sir Gerald Fitzmaurice and the world crisis: a legal adviser in the Foreign Office, 1932-1945. ISBN 9041112421, 9789041112422 (The Hague: Martinus Nijhoff Publishers, 2000), p. 312. This is a faint but legible official facsimile photocopy from the Public Record Office. You can see it here. Michael Alfred Peszke. The Polish underground army, the Western allies, and the failure of strategic unity in World War II. ISBN: 078642009X DDC: 940.54120899185 (Jefferson, N.C. : McFarland, c2005), pp. 105-107. Anita J. Prazmowska. 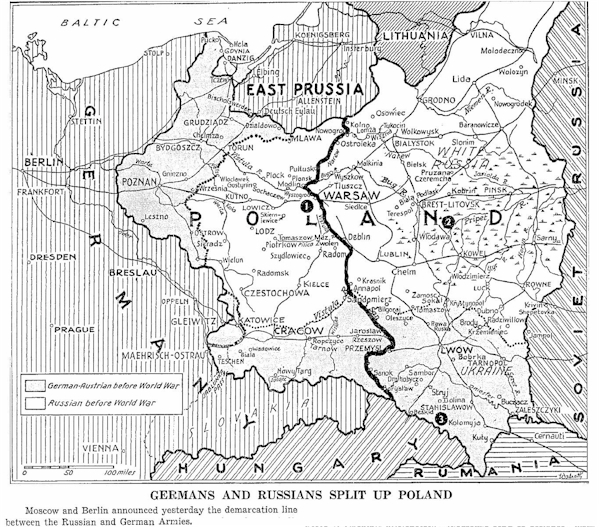 Britain, Poland and the Eastern Front, 1939. ISBN 0521529387, 9780521529389 (Cambridge University Press, 2004), pp. 201-204 ("secret protocol" on pp. 203-204). I have put the whole text online here. A PDF version, from Peszke (2005) is here. * The British war blue book. Miscellaneous no. 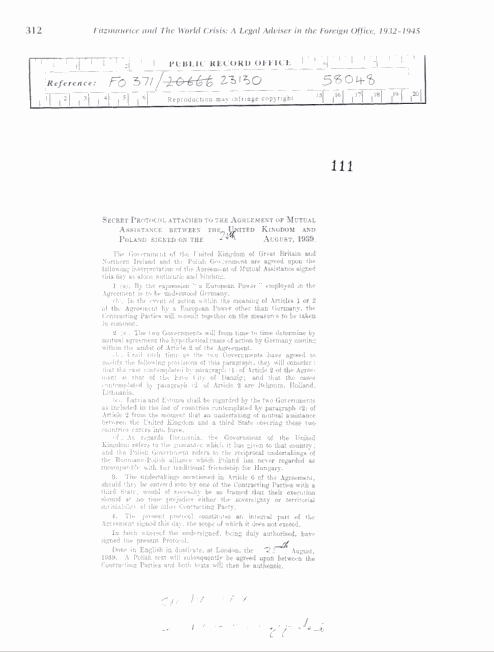 9 (1939) Documents concerning German-Polish relations and the outbreak of hostilities between Great Britain and Germany on September 3, 1939. Great Britain. Foreign Office / New York, Farrar & Rinehart, 1939.